Due to the holidays and tons of special events at school, our social skills group was on a brief hiatus. Now that all of the festivities are done, we are back at it! Our last two sessions were spent learning about bucket filling. If you don't know about bucket filling, you are seriously missing out on a great teaching opportunity of sending students on the path of becoming a kind and caring person. 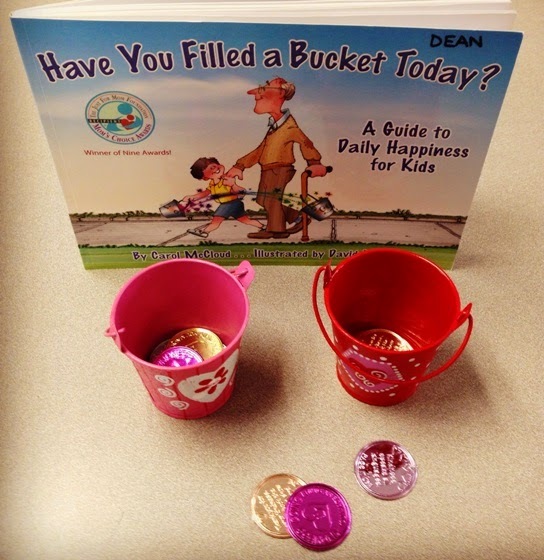 The book "Have You Filled a Bucket Today? - A Guide to Daily Happiness for Kids" by Carol McCloud is really all you need to get started. The book suggests that everyone walks around with an invisible bucket -- this bucket contains all of an individual's positive thoughts and feelings about themselves. You can fill someone's bucket by being kind to them and showing them love. By doing so, you fill your own bucket, as well. This makes you a bucket filler. However, if you choose to be mean and unkind to others you are a bucket dipper -- you take away the positive thoughts and feelings from someone else. Bucket dipping empties your own bucket, too. I love using this book to teach students about kindness and empathy, as well as some early perspective taking. My students always really enjoy the pictures, as well: the buckets always resemble their owners and the kids like pointing out the similarities. You could also ask them what they think their own bucket looks like (hey, since it's invisible, there are no right or wrong answers!). During the first session of our social skills group we simply read the book and discussed it. Asking my students to think about the things they had done just this week to fill or dip into someone's bucket gave them some serious food for thought. I opened the next lesson with a game: I brought little tin buckets for each student as well as some tokens (I used "kindness coins" -- I purchased both items at Oriental Trading a couple of years ago). After each student received a bucket and we reviewed what bucket filling and bucket dipping means, students picked a scenario card that I had typed up. Each card contained a situation that was either an example of bucket filling or dipping. Students had to identify what kind of scenario was portrayed -- if it was bucket filling, they received a coin for their bucket; if it was bucket dipping, they had to remove a coin. This was also a great activity to work on how to deal with losing ;). For those of you who have previously purchased my Social Skills Curriculum, you will find that I added this activity to Lesson #6, complete with buckets, tokens, and scenario cards. And if you have not yet added this little book to your library, I highly recommend it! I get a lot of mileage out of this concept with my students.